After two weeks of solid production playing daily fantasy football I must admit my hopes are high for week 14. There's a bevy of under priced players that are coming on late in the season which gives up plenty of flexibility at multiple positions. 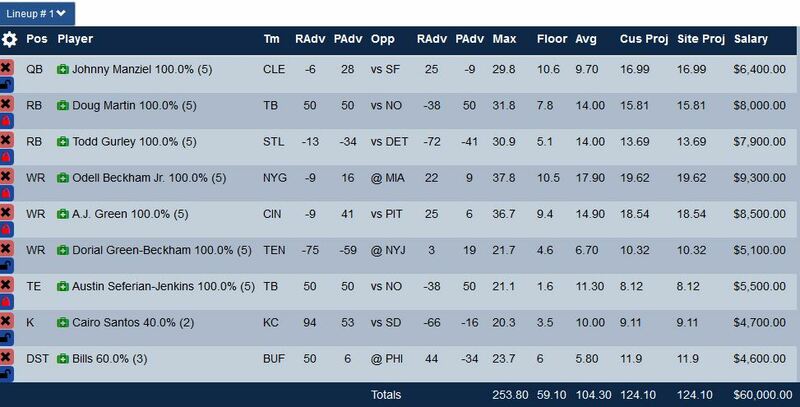 Let's take a look at some optimal lineups for the three main daily fantasy sports sites: FanDuel, DraftKings and Yahoo. I'll limit my exposure to the same players here and there but honesty there's going to be some overlap. Overlap kills me some weeks, and others it pays off. At the end of the day I simply don't play enough contest to have exposure across all the players I like and chances are you're in the same boat. The FanDuel optimal lineup below is more of a GPP play on FanDuel. If you're looking to make this a cash game lineup I'd avoid the Bills Defense, Manziel and DGB. Unfortunately if you did that you wouldn't have enough cap space for the remaining studs. With that said, this is the perfect example of a studs and duds lineup which is commonly used in large field tournaments. I recommend sticking to the 1,200 and under tournaments (I tend to break even at the very least in those) and for the larger ones look for the single entry contest. As you can see in this image I've locked in several players and let the tool fill in the blanks. Our optimal lineup tool grabbed Dorial Green-Beckham for me who finally emerged for the Titans last week. I love end of season trending players and you should too! This has got to be the strongest lineup I've seen for DraftKings all season. Seriously take a look, we have a stack of Winston and ASJ against the leagues most porous defense. McCoy in a revenge game, Brown who is unstoppable this year along with a bevy of other upside picks. Grabbing Bryant and Brown for the same lineup isn't really a positive correlation however, I've seen double downing on a wide receiver core pay off in large tournaments on multiple occasions this year. So why didn't I select Big Ben? Well it's all about his salary cap hit and Winston is just in a really favorable spot. You could easily replace Martavis with another guy of your liking without sacrificing any of the other studs seen below. Never doubt a player in a revenge game. McCoy gets to face his old head coach and I'm sure he's more than focused to make him look stupid after the ugly exit he had to endure leaving Philly. Another week of decent earnings playing daily fantasy football on Yahoo. 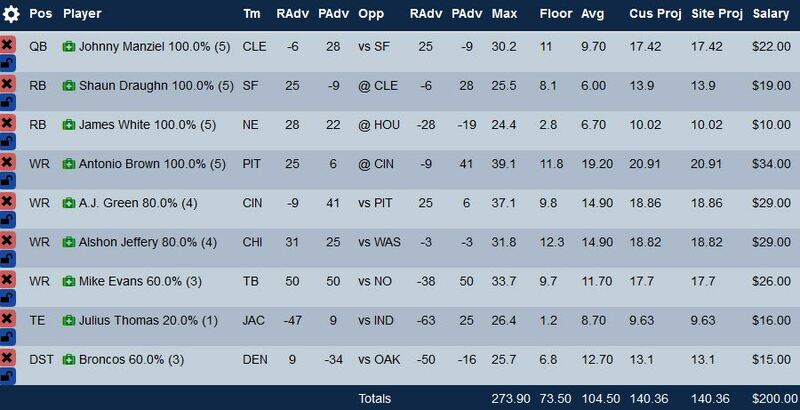 I've been able to play on house money (GPP) since the beginning of the NFL season. I prefer and do the best playing the smaller contest with player pools of 5,000 and under as well as the single entry tournaments of any size. I recommended Draughn last week and he got us 80+ all purpose yards, 5 catches and a touchdown. The tool likes him again this week as well as James White. The WR core in this lineup is unstoppable and should help you bring home a win in week 14. You'll need some luck with Manziel and Thomas though, which isn't asking for a lot considering both the RAdv and PAdv is positive for both positions. And since I filtered out any players facing a top 6 defense (fantasy points against position) the matchups are good enough to roll the dice in a tournament contest.